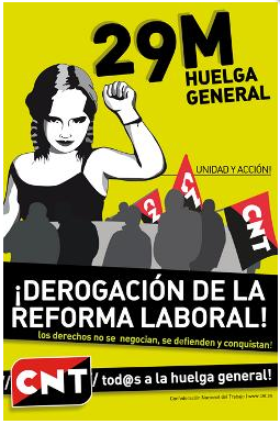 Support to the General Strike on March 29 called by the Spanish CNT- AIT! 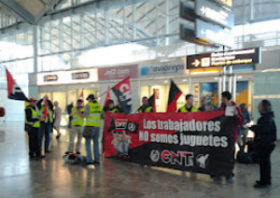 The CNT-AIT and the Spanish working class are involved in a bitter fight and call on the support of the international working class. The so-called Labour Reform is a direct attack on the workers rights, pay and working conditions. In 2010, the “socialist” government introduced a round of measures which slashed public sector pay, drove down pensions and cut public services. The new right wing government is carrying on where the old government left off. They are embarking on yet another round of austerity cuts which will further drive down the conditions of life of Spanish workers and it aims to crush or/and weaken the ability of workers to organize and fight. IWA- Action Days: Rally! Hands off Social Rights! The struggle for power between different political groups, as expected, didn`t give solutions to the most pressing social problems of workers in Russia. Elections come and go, but our situation isn`t changed for the better. We obtain the lowest wages and pensions in Europe. The prices of essential commodities and of all necessary services (housing and communal services, transportation etc.) rising continually. The "law of the state-owned institutions" (FL-83) is introduced which finally takes the health, education and child care on a commercial ground, and makes them more and more unaffordable for ordinary workers and pensioners. The ?single state examination? at the end of school study, due to overall corruption, favors students whose parents have fat wallets. The workers in enterprises and institutions are completely powerless: the 8-hour workday is, in fact, canceled in many enterprises and institutions; the right to organize trade unions in a large part of firms simply does not exist; the ability to strike is reduced almost to zero, and the workers and social activists are persecuted for their convictions and dismissed for attempts to defend their interests (the practice of "ban on the profession"). The migrant workers are completely deprived of any rights at all. The SF-IWA will be launching a campaign against Workfare as part of the IWA- Actions on March 29, 30 and 31! As part of the International Workers Association (IWA) days of action against austerity, exploitation, and oppression, the Solidarity Federation will be launching a national campaign against Workfare. On the 29th & 30th March, Solidarity Federation Locals will leaflet companies using the Workfare scheme advising workers of their rights. On the 31st March one national company will be targeted with coordinated nationwide pickets and a communications blockade with the aim of forcing the company to stop using Workfare. The name of the target company will be announced a few days prior to the 31st March to ensure the company cannot prepare against the planned actions. On March 18, the comrades from the CNT unions from Elche and Alicante protested in the airport as part of the action of the "Ryanair Don't Care" campaign initiated by John Foley when his daughter was fired as a flight attendant during the trip and abandoned abroad without a cent. This is a campaign which the comrades from the Solidarity Federation and, by extension, the IWA has supported. John has been detained 6 times for his direct action activism, denouncing the abuses committed by this company and its cynical working conditions. 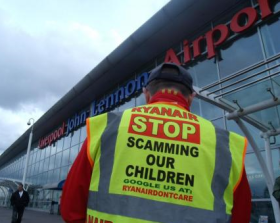 To round off our week of action against Ryanair, Liverpool Solidarity Federation and Ryanair Don't Care campaigner John Foley today picketed Liverpool John Lennon Airport. Though not quite the spectacle that the previous day had been, it was succesful in getting across the key message: end the Ryanair recruitment scam! We pitched up outside Departures at around twelve o'clock, with banners and signs, and began distributing leaflets to people as they came and went from the airport. This quickly attracted the attention of the police, though this time they felt no need to bring in horses and we were allowed to carry on our picket without interruption. Those who took our leaflets were generally receptive, with more than a few asking for more information and expressing their sympathy with the campaign. Those we gave flyers to included Ryanair cabin crew, who informed us that our presence had become the subject of much talk and people were waiting for us to attempt to enter the airport. We were also joined for a few minutes by Spanish tourists who, seeing our flags, asked if we were anarchists and revealed themselves to be members of Solfed's Spanish sister section the CNT! The action finished with John and several Solfed comrades entering the airport in order to display the campaign banners by the Ryanair ticket office. At the end of the day, John said, "thanks to all who took part in the week of action. I am proud of the support and hard work from all of you." That marks the end of this week of action in Liverpool, but the campaign against Ryanair will continue as long as the recruitment scam does! More pictures from the week of action can be seen on the Mersey Solfed Facebook page. Priama akcia – IWA Slovakia joined the International week against Ryanair practices in several ways. We published an article about the company scam on our website together with an appeal to send complaints and other possibilities how to express discontent with Ryanair practices – sending faxes, calling Ryanair and spreading the information as much as possible. We have also found several negative experiences of Slovak Ryanair workers on the Internet. 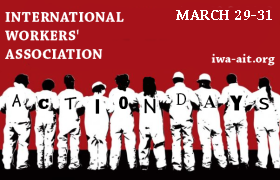 The International Workers Association (IWA) organizes Action Days on March 29, 30 and 31. The Actions are international and against Capitalist Austerity Measures, Exploitation, and Oppression with focus on global, regional and local issues/ work conflicts etc. The IWA -Actions coincide with the March 29 General Strike in Spain. The Spanish CNT-AIT has made a call for General Strike and Sections and the IWA- Secretariat will show solidarity with our Spanish sister organization. March 29 is also an Action Day in solidarity with dismissed ZSP comrade from ROCHE Polska. We are receiving information about participation in the IWA Actions Days, and so far from: ZSP (Poland), SF (Great Britain), CNTF unions (France), KRAS (Russia), AIT- Portugal and NSF (Norway). The IWA- Action Days also coincide with the European Day of Action against Capitalism on March 31 (M31), partially organized by FAU (Germany), USI-AIT (Italy) and CNTE (Spain). The International Workers Association (IWA) is convinced that workers must fight against the Capitalist Austerity Measures, Exploitation, and Oppression by Direct Actions and International Solidarity. The IWA Sections are run by the workers themselves and without paid “functionaries”, they do not class collaborate and won`t receive financial subsidies from the capitalists and the state. Workers will never be truly free from exploitation and oppression until the workers of the world organizes and fights with the goal of substituting the present capitalism with a system run by themselves that can provide real social and economical freedom for the workers! Long live the IWA and anarchosyndicalism! Against the Labor Reform, Cuts and Attacks against the Working Class. The CNT rejects any negotiations over rights already won and demands the repeal of the Labor Reform. The Confederal Committee of the CNT has agreed to call 24-hour general strike on March 29, extending the call already made in Galicia and Euskadi, a call that will be formalized in the coming days. CNT rejects any negotiations on the rights won by the working class struggles in years, so it calls this strike calls with the main objective of immediately repealing the labor reform approved by parliament yesterday, which it considers a frontal assault against the rights and the living conditions of the working class, continuing the measures taken by the previous government, such as the labor reform of 2010, the lowering of wages in public administration or the cuts in pensions and public services that the current government is deepening. CNT calls for an end to economic policies designed to make workers pay for the crisis of the banks and employers, which has led to an intolerable number of unemployed, which continues to grow and to the impoverishment and worsening of the living conditions of the working class. CNT also calls the strike against the cuts, the day before a State Budget will be implemented, constituting a brutal attack on public services and social rights. CNT rejects the Agreement for Employment and Collective Bargaining reached by CCOO and UGT and the CEOE last February, in addition to the amendments proposed by these unions to the parliamentary process of reform, rejecting them as being no valid alternative, as it shares the spirit of reform and assumes the logic of the employers and the government, assuming that the output of the crisis must be determined by assignments on the rights of workers, starting by placing the working class in a position of weakness. The same logic brought these unions to accept the extension of the retirement age to 67 after the general strike of 29S. For the CNT, the strike of March 29 should be just the beginning of a process of increasing and sustained mobilization, to incorporate the whole of the working class and those most disadvantaged and affected by the capitalist crisis, to curb the constant dynamic of agression against our rights, laying the foundations for the recovery and conquest of new social rights in the context of a profound social transformation. All these reasons have led the CNT to make its call for March 29. With this call, the CNT wants to cover all those who are committed to real, sustained confrontation, to return the attacks against the working class with the same degree of forcefulness we are receiving, along with all those labor organizations that share these objectives and reject the politics of the pact and social peace. For CNT, the frontal rejection of the politics and model of trade union bureaucracies of CCOO and UGT, discredited with large sections of workers, should not turn into an excuse against the mobilization and struggle but should spur it on, to reinforce it though a different form of unionism, through direct action, autonomy, and mutual support. Given the magnitude of the attacks we are suffering, the unity of the workers is fundamental, a unity that has to be manifested from the bottom, from assemblies in the workplaces and neighborhoods, demonstrations and pickets to mobilize against those responsible and the beneficiaries of this situation: employers, banks and the government, an unstoppable process that raises a barrier against the temptations to turn everybody's rights into anyone's currency. It is time for all workers, employed or unemployed, retired, illegally employed, students, or precarious workers to say: enough! Let us take the street, not abandon it, to enforce our strength and our demands. On March 29, all to the streets, all on strike! Permanent Secretariat of the Confederal Committee. Where strikes are forbidden, there is no right to strike! Hereby we declare our solidarity with the striking colleques of the air traffic controllers' union (GDF) at the airport of Frankfurt am Main. The prohibition of strikes, decided by Frankfurt's labour court, initiated by Fraport and Lufthansa, make quite clear to everyone that there is no right to strike in Germany at all. This so-called constitutional right has been constantly breached by minor labour courts in the interest of companies.